This week: More evidence that social proof is important, Google adds an important new feature to GMB, and wait until you hear how many manual action penalties Google dispensed last year. Google is releasing a new Smart display campaign that will automate targeting, bidding, graphics, and text in display ads. Smart display campaigns combine your assets — headlines, images, and so on — to create image and text ads. They can even transform into native ads, blending seamlessly into the fonts and feel of publishers’ sites. Over time, your ads optimize based on what wins you conversions. Smart campaigns also support retargeting. Speaking of display ads, they’re not as good at bringing foot traffic into local stores as native ads. That’s according to a joint study conducted late last year by native ad provider Sharethrough and location analytics provider Placed. On average, the in-store lift from native ads was 300% more than lift from other ads. It should be noted, though, that the study didn’t not account for a number of other factors related to digital ads. For example, it didn’t distinguish between video and static ads or between mobile and desktop ads. That’s significant considering that he runs a native ad provider. It’s typically cheaper to keep the customers you have than to recruit new ones. 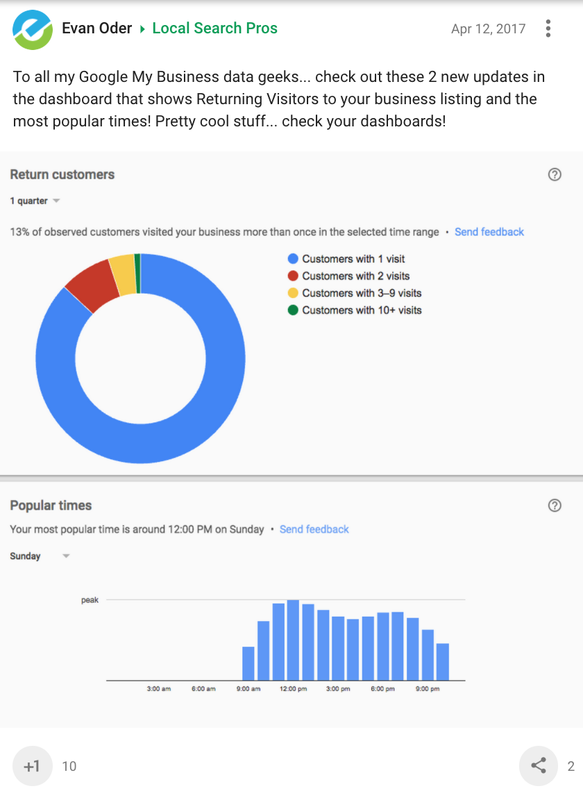 Google understands that and is now offering a new report on returning customers in Google My Business (GMB). The report is presented as a circle graph. It’s color-coded to show you the number of customers who only visited once, the number who visited twice, the number who visited 3-9 times, and so on. As of now, though, not every Google My Business user has access to the new report. Apparently, it’s rolling out gradually. According to Google’s annual webspam report for 2016, the company sent about 9 million messages to site owners on spam issues last year. That’s more than double the 4.3 million messages sent in 2015. Google also claims to have received 180,000 user-submitted spam reports in 2016. That’s down from the 400,000 reports the company received the year before. You might have thought that you could escape commercials by watching videos online. You were wrong. Now, even Twitter is including mid-roll video ads. As the name implies, those are ads that run in the middle of the video. Twitter has already been running pre-roll video ads for a while. Another study validates the importance of social proof. According to ReviewTrackers’ Local Search and Online Reviews Survey, more than 50% of consumers often or always check out online reviews of a business. Only 34% of those surveyed look for online pricing and discount info. In addition to that, 62.7% of consumers view online reviews as “important” or “very important” when choosing a local business. Only 3% don’t even consider reviews when choosing a business. Finally, the research shows that almost 70% of consumers read reviews while researching a purchase decision.